조선 전기의 문신인 이언충(李彦忠 :1524~1582)의 무덤에서 출토된 유물들이다. 이언충은 성주이씨(星州李氏) 조년(兆年 :1269~1343)의 9대손으로 명종 때 병조좌랑, 사헌부 지평, 호조참의, 승정원 도승지, 형조참판(종2품) 등 고위 관직을 두루 역임한 인물이다. 이 유물들은 2000년 4월 서울시 노원구 중계동 성주이씨 도정공파 종회 문중의 선산에서 묘 이장 중에 발견된 것으로 직령 4점, 답호 6점, 철릭 4점, 액주름 1점, 적삼 2점, 바지류 6점, 그리고 명정 1점 등 총 7종 24점이다. 이언충 묘 출토복식은 묘주의 인적사항이 확실하여 다른 묘 출토유물의 연대를 추정하는데 기준이 되며 16세기 복식사와 직물사·생활풍속사 연구에 중요한 가치가 있다. 그리고 수도권에서 발굴된 임란 이전의 복식자료로 당대 서울지역 고위 관리층의 복식문화와 장례풍습 연구에 크게 기여할 만한 자료이다. 또한 이 유물은 관 내부를 채우기 위한 보공의(補空衣)로 그 종류가 다양하고 출토상태가 거의 완벽하여 복식의 형태 뿐만 아니라 직물의 조직·문양·바느질 기법까지도 파악할 수 있는 귀중한 복식연구 자료로 평가된다. Yi Eon-chung (1524-1582, childhood name: Sa-gyeong), a scholar-official during the early Joseon Dynasty, was a ninth-generation descendant of Yi Jo-nyeon, a prominent ancestor of the Seongju Yi Clan. During the reign of King Myeongjong (r. 1545-1567), he served in high-ranking positions at several government agencies, including the Byeongjo (Ministry of Military Affairs), Saheonbu (Office of the Inspector-General), Hojo (Ministry of Taxation), Seungjeongwon (Royal Secretariat), and Hyeongjo (Ministry of Punishments). 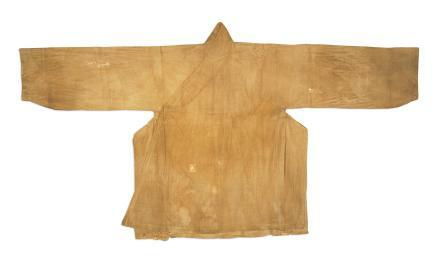 These clothes were found in April 2000, while his tomb was being moved from a clan cemetery in Junggye-dong, Nowon-gu, Seoul. 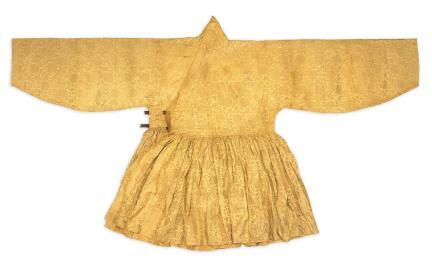 They include a myeongjeong (funeral flag), six dapho (robe with straight collar and short sleeves), four jingnyeong (men’s coat with straight collar), four cheollik (military officer’s coat pleated at the waist), one aekjureum (inner coat), two jeoksam (unlined jackets) and six pairs of trousers, totaling twenty-four items in seven kinds. The funeral flag is a rectangular piece of fabric bearing the family name and official title of the deceased person. The flag would have been carried at the head of the funeral procession and then placed on top of the coffin before burial. The short-sleeved robe with straight collar was worn over a military officer’s coat with pleated waistline and under a ceremonial robe, an official robe with round collar. 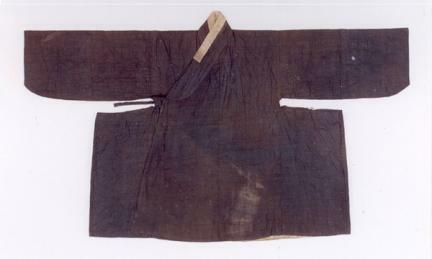 It has double lapels and twin tie-ribbons connected with rings; the front panels are shorter than the back panels in the unique early Joseon style. The robes with straight collar were also courtiers’ official uniforms. They have double lapels and twin tie-ribbons. 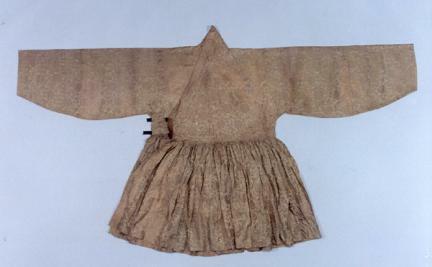 The reinforcing patch inside the back panel is in the H shape of the early Joseon style. The front panels are shorter than the back panels. The military officer’s coats pleated at the waist typically have double lapels and long straight sleeves. They have twin tie-ribbons fixed either with rings or attached to ribbon patches. The stitching is exquisite. The inner coat pleated under the armpit has a straight neckline. 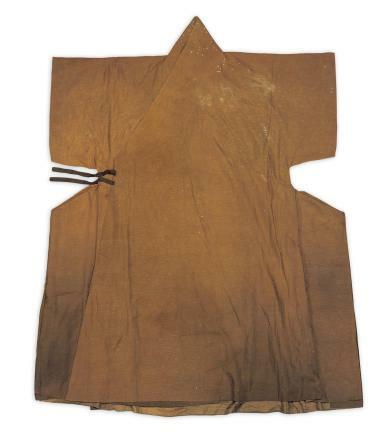 As coats in this style have been excavated only from early Joseon tombs, they offer useful clues in dating other artifacts. 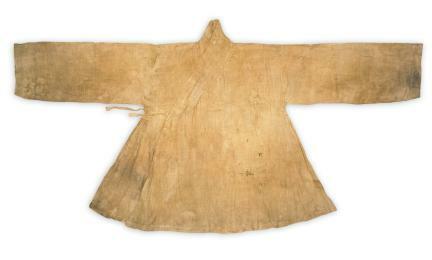 The two unlined jackets are both made of ramie, and have broad panel-type collars and finely darned bias trimming. 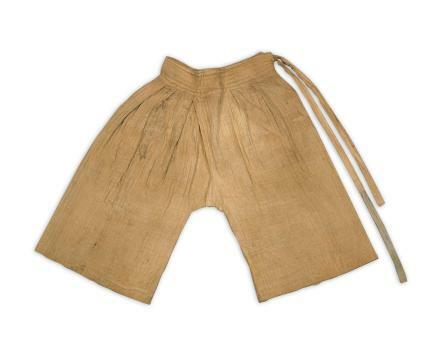 The six pairs of trousers include two types: those with open bottoms and those with closed bottoms. As the owner of the tomb has been clearly identified, these relics can be reliable dating references for antique objects excavated from other tombs and valuable sources for historical study of dress, textiles and living customs of the 16th century, especially the dress and funeral customs of elite bureaucrats in the capital area. As most of the garments were placed in the coffin to fill the empty space inside, they vary in kind. 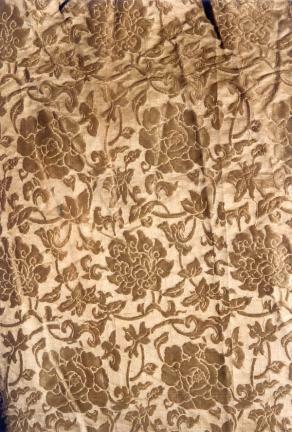 Discovered in excellent condition, the garments are precious materials for studying not only dress style but also fabric textures and patterns as well as sewing techniques.